At Show Sales Success: How to turn lookers into buyers! Part 3 of The NBM Show: Trade Show Exhibitor Academy will feature the topic, “At Show Sales Success: How to turn lookers into buyers!”. This is the GOAL of all exhibitors! 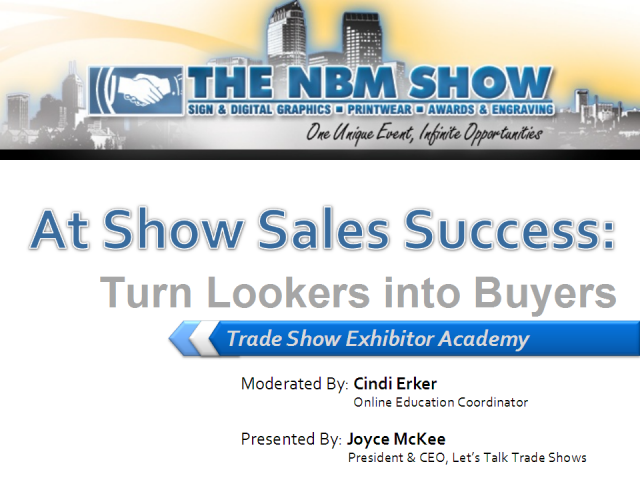 Joyce McKee will reveal the secrets of drawing buyers into your booth. She’ll address the issue of booth sales people: are they actually selling (?) and how to keep them engaged during the show. She will explore the hidden visual barriers that keep buyers away from your booth (carpet color, table location, body language of your sales rep, etc.) Have you ever had a large crowd around your booth? Did you know that this could actually be pushing buyers away? Joyce will reveal the warning signs that it’s time to take more space at the show and the success this expansion will provide. If you want more information on how to turn lookers into buyers, then mark your calendar! This is a “must see” webinar! Part 4 of The NBM Show: Trade Show Exhibitor Academy will feature the topic, “Consider shows as investments, not expenses!”. Calling all exhibit managers to think outside the box! Joyce McKee will share her insight on how to view trade shows as investments in building your business and gaining market share. She will offer tips on how to lower drayage and union costs while having more money to spend on promoting your presence! She’ll review how to get your money’s worth out of lead retrieval. She’ll give you an insiders look at move-in and move-out procedures. Finally she’ll explain the role of AGS and ways to get them in your corner. If you’ve ever had to explain your costs after a show before you discuss your success, then this is a webinar you won’t want to miss! Part 2 of The NBM Show: Trade Show Exhibitor Academy will feature the topic, “Marketing your presence to attendees: What will bring them to your booth”. This timely topic is a MUST for all serious exhibitors. You’ll learn the importance of pre-show marketing. What produces more results, direct mail or e-mail? You’ll learn tips to tie your pre show marketing with your post show follow up. Explore the tricks of how to successful market your product or service BEFORE the show and then AT the show. Do you want buyers to come to the show looking for you? Then you won’t want to miss this informative webinar! The ROI of trade shows: How to show a solid return on your trade show marketing dollars. In this current market climate, you want to KNOW that your trade show dollars are working for you! Joyce McKee will help you focus your decision making and answer the tough questions such as how to get a good ROI from your trade show investment, how to prove that your trade shows are making money for your company, how to get trade show metrics like “leads generated” to tell the full story, etc. If you want to make wise show decisions for 2010, then this is a webinar you won’t want to miss! This Webinar Channel is dedicating to helping NBM clients achieve the best possible results from their marketing programs. Topics will include proven strategies for getting the most out of print advertising, eMedia marketing and exhibiting at trade shows. Title: At Show Sales Success: How to turn lookers into buyers!